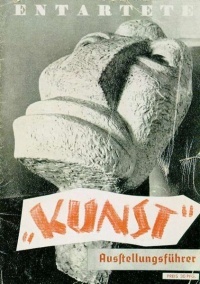 Cover of the Nazi Germany 1937 Degenerate art exhibition. This exhibition is also a perfect illustration of the beneficial side-effects of censorship. Beneficial in the sense that any attempt at banning works of art, books or other cultural artifacts results in an aide to discerning culturati to seek out this forbidden fruit with zeal. Such has been the case with Video Nasties, the Index Librorum Prohibitorum (the Catholic Index) and the Degenerate Art expo depicted above. The beneficial side effects of censorship are best illustrated by German writer Georg Christoph Lichtenberg's dictum which stated that "The book which most deserved to be banned would be a catalogue of banned books." Beneficial in the sense that any attempt at banning works of art, books or other cultural artifacts results in an aide to discerning culturati to seek out this forbidden fruit with zeal. Such has been the case with the Index Librorum Prohibitorum (the Catholic Index), the visual art of the Degenerate Art exhibition (picture, right) and to a lesser extent, the Video Recordings Act 1984. Unless indicated otherwise, the text in this article is either based on Wikipedia article "Beneficial side effects of censorship" or another language Wikipedia page thereof used under the terms of the GNU Free Documentation License; or on original research by Jahsonic and friends. See Art and Popular Culture's copyright notice. This page was last modified 07:42, 14 March 2014.